In small bowl, mix all sauce ingredients with wire whisk until smooth. Remove chicken from bones; cut into bite-size pieces (about 3 cups). In large bowl, toss lettuce, chicken, parsley and onions. Place lettuce mixture on center of large serving plate. Arrange noodles around edge of plate. 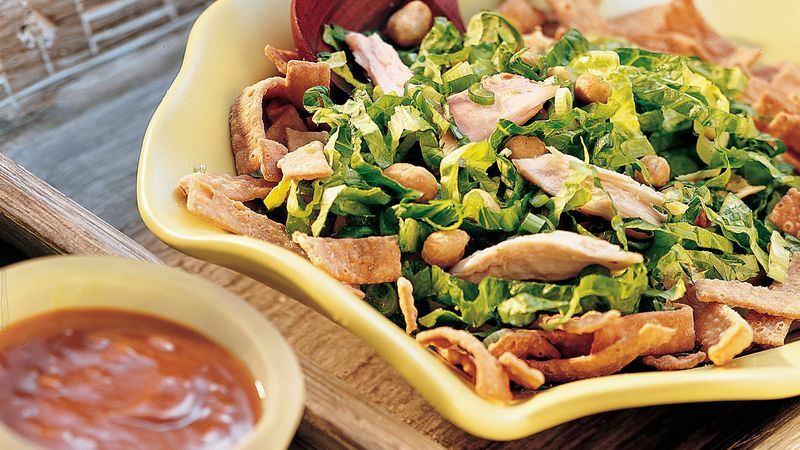 Sprinkle peanuts over lettuce mixture. Drizzle sauce over salad. If you aren't concerned about sodium, you can use regular soy sauce. In a pinch, 3 to 4 cups of regular chow mein noodles can be used instead of the wide noodles.